In the United States, the recognized legal tender consists of U.S. dollars and coins issued by the Federal Reserve. 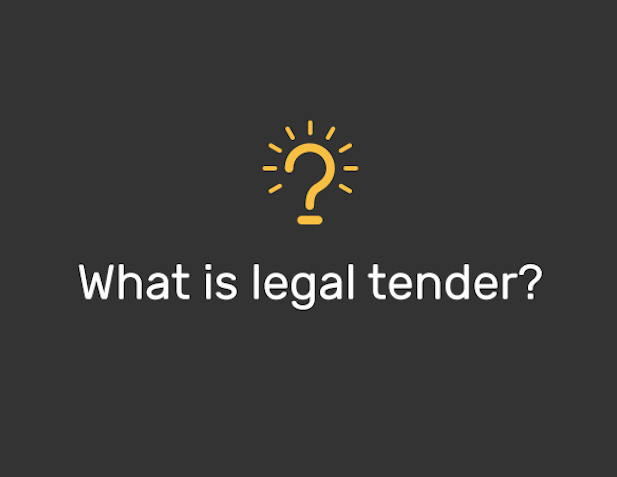 A check, or a credit swipe, is therefore not legal tender; it merely represents a means by which the holder of the check can eventually receive legal tender for the debt. Widely accepted currencies such as the U.S. dollar and euro are accepted as legal tender in many nations, especially those where foreign currencies are in short supply. Countries with extensive business and cultural ties may also accept each other’s currencies as legal tender in limited amounts. For example, some U.S. and Canadian merchants located close to the U.S.-Canada border accept both Canadian dollars and U.S. dollars as payment for goods and services. The U.S. dollar is also used as legal tender in countries which either do not issue currencies of their own, or have found the stable dollar preferable to their own currency. For example, Ecuador adopted the U.S. dollar as legal tender in 2000 after the Ecuadorian-issued currency, the sucre, depreciated rapidly such that $1 was worth 25,000 sucres. Adopting the U.S. dollar as the primary legal tender is colloquially known as ‘dollarization’ – the practice generally is called currency substitution. The popularity of cross-border and online shopping is increasing demand for more forms of legal tender; however, given official objection to such alternatives, these may still be some years away. In May 2013, the governor of Arizona vetoed a bill that would have made gold and silver coins legal tender in the state, in addition to existing U.S. currency. There is additionally an increased demand for popular cryptocurrency alternatives such as Bitcoin and XRP to be recognized as legal tender. While there are many online services which issue products that can be purchased with cryptocurrencies, and this practice is perfectly legal, they do not represent legal tender in the United States, or in most countries in the world. However, as of early 2018 there are several exceptions. Facing devastating hyperinflation, Venezuelan President Nicolas Madura ordered all federal institutions to accept a new cryptocurrency, the petro, as legal tender. The petro is backed by Venezuela’s natural gas, mineral, and oil reserves. The tiny Republic of the Marshall Islands also announced that it would adopt a new cryptocurrency, the sovereign, as legal tender. However, the sovereign will be pegged to an existing, decentralized peer-to-peer cryptocurrency market, while the Venezuelan petro is controlled centrally by the Venezuelan government, based on their own estimation of the value of their natural resources.